I slept early on a Friday night only to be awaken by a barking dog outside my studio at 2:30am. I couldn't sleep after that so I decided to finally take pictures of the nail art I have been wearing for 2 days. I don't normally wait this long to take photos of a design but I was actually testing how long the pearl beads would hold. Allow me to show to you first the polishes I used for this nail design before I get into talking about those pearl beads. I knew that I wanted to use Revlon 761 Scandalous as a background color but since this polish has a sheer base, I didn't want to apply more than 3 layers to get the opacity I wanted. So I applied a coat of Revlon 650 Sugar Plum first before applying 2 layers of Scandalous. I have reviewed and swatched these nail lacquers here and here. Now, onto the pearl beads. I was fixing my personal nail station when I stumbled upon some craft wheels that contained several nail art accessories that included these half pearls. I remember purchasing them online when I was just starting to blog about nail art, but I never got to use them until now. I am not really fond of creating designs that involves embellishments (except for my cupcake design) because I sometimes feel awkward when I feel them. 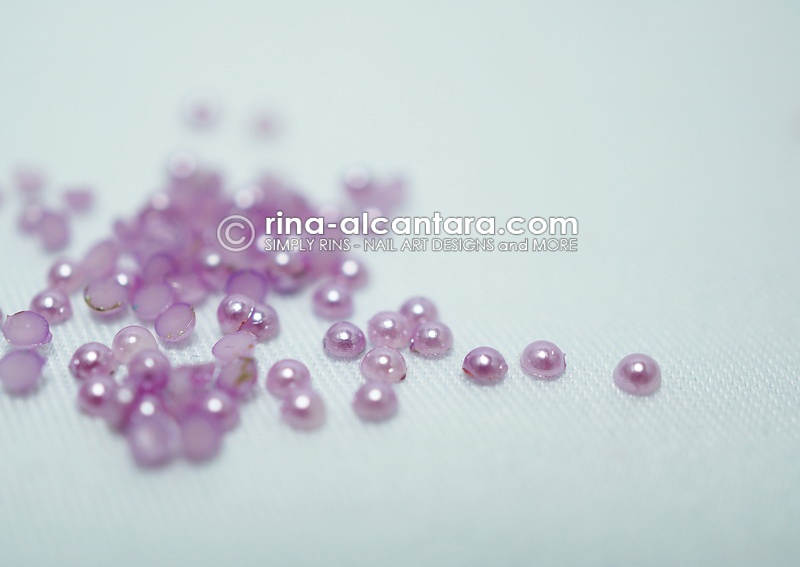 For this nail design, I used a very light purple half pearl beads. I hand painted a flower on each nail using acrylic paint and a detailing nail art brush and used the pearls as the center for every flower. And I added a few scattered dots for further detail. I have mixed feelings with this nail design but one thing I know is I really love Scandalous, particularly the chunky glitters. It actually gives depth to the polish. What are your feelings about this design? Have you tried using half pearls on any of your nail designs? I just got a bunch of 1/2 pearls from bornpretty. They look adorable as flower centers, thanks for the idea! I think you did a great job. Wish you where here so we could do our nails together. HA HA...I have used Fing'rs nail&body rhinestone kit but just as an accent finger or toenail application. On the ring finger or big toe. "www.fingrs.com Love your talent. Gorgeous. I love a crisp white design on a dark background and the glitters in Scandalous make it that much more interesting. The pearls are icing on the cake! Wow, it looks great! Beautiful. Your nail art it's very amazing, it's a good job.